Tonight marks our first-ever visual-arts item. 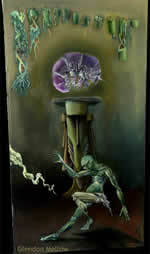 It is a painting named Symbiosis from Glendon Mellow. More about Glendon can be found at his blog and at his page on Deviant Art. Click on the representation of the painting below for a much larger image. Symbiosis: Oil on canvas. An image of shared mortality, seldom recognised. The tardigrade floats free in its relationship to macroorganisms, the human bound to its symbiotic relationship with his digestive microorganisms. A beautiful and sad relationship, forged over the course of human evolution, free of the supernatural. DNA-candles and monuments remain as symbols of mortality.